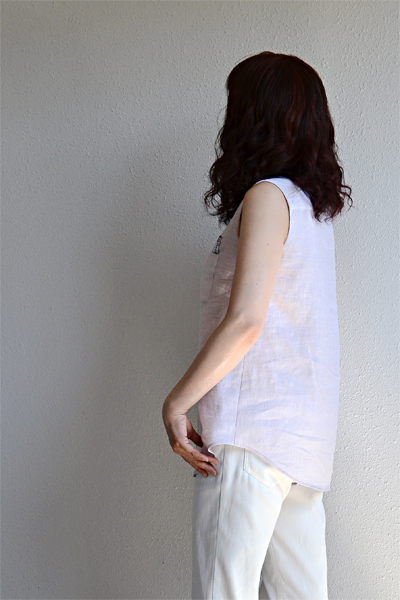 I sewed another shirt using Alder shirt dress pattern from Grainline Studio. 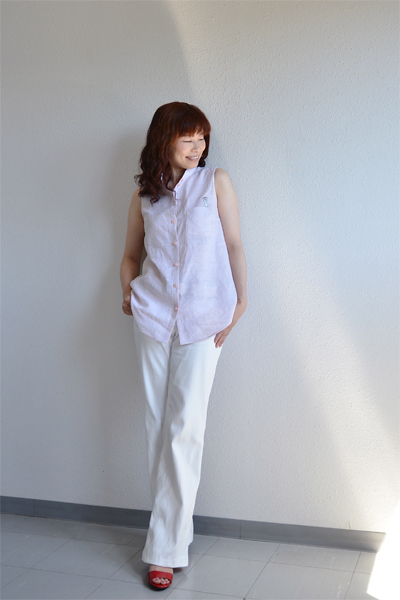 This time it was made as a simple sleeveless shirt. I chopped off the lower half of the pattern and used the rest of it practically without modification. If I say something special about it, it would be that it is missing one of the pockets and the collar due to the fabric shortage but it has got a small embroidery in the chest as if it is compensating the missing parts. Ah, you have to be informed that I was a teen when I embroidered the last time. I find that all my humble skill in embroidery has been lost by now. Now I can do it only humorously. The shirt is pretty, and comfortable in the hot weather too. This year in Japan, the rainy season was suddenly taken over by hot days and the summer started without delay. At this moment I'm struggling with this hotness more than usual (I'm a snowman, in case you don't know me), as we didn't have enough time for adapting to the heat. pattern: Alder from Grainline Studio, with size adjustments (raised armhole base and shortened shoulder width). fabric: Lightweight linen woven fabric, pale pink brown, with off white pinstripes. Slightly sheer but can be worn as a single layer. Crisp and casual. Not too coarse. 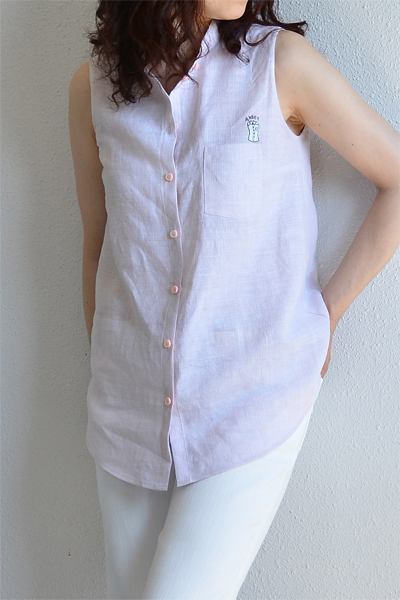 Typical linen plain woven. Same fabric was used in this shirt. tie dying is so much fun and unpredictable. I know you will enjoy it and find yourself addicted. Thank you, kathy! It'll be surely fun to learn tie dying. I can't wait! Your top is so pretty, the embroidery is a really nice detail and I think it looks great! Have fun with the tie dying, I've been wanting to try that out too. Would love to see what you make. Love the shirt - the best style advice I ever got was keep it simple and always look cool in summer and warm in winter! Thank you Gail! You surely sound right. It's great way to be flawlessly perfect. And it is do-able! You always manage to look effortlessly stylish! I was thinking of making the Alder as a shirt for summer and leave off the collar. It looks lovely and cool to wear. Thank you, Andrea, your words made my day! Alder has clean line in the bodice and I definitely recommend it as a shirt pattern. Good luck to you! The embroidery is a wonderful addition to your pretty shirt. Thank you, Emi! It will be 1-hour workshop in Tokyo. I'll check if it is great for little humans too. If so, you may like to check whether you bring your lovely ladies there to experience tie dying or not. I look forward to your tie dying pieces. I can't believe you have just gone back to embroidery. It looks great. Thank you, Maria! I'm thinking what colors I'm going to use in the palette. I hope I'll get something good enough to show you at the workshop. The embroidery on your shirt is so whimsical, I love it! I love to play with dyes. Have fun! 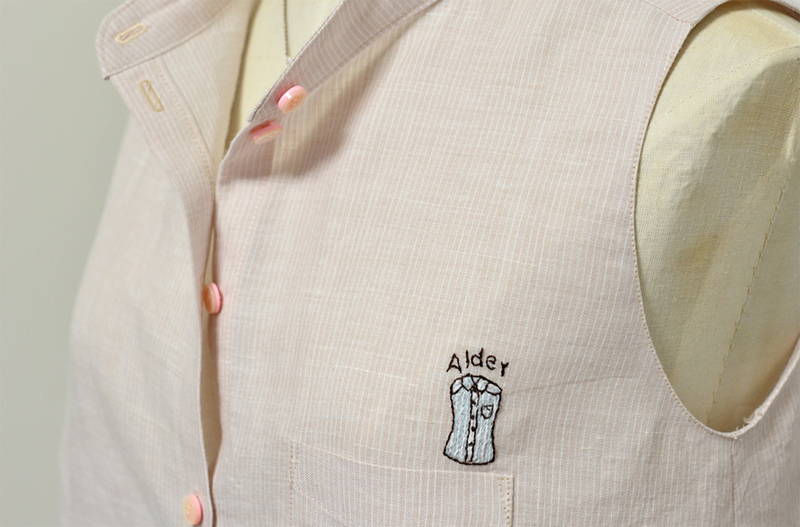 Your sleeveless alder shirt is just perfect. Tie dying is such fun you will go home and want to dye a whole batch of things! Beautiful simple blouse and then you add the embroidery, perfect!